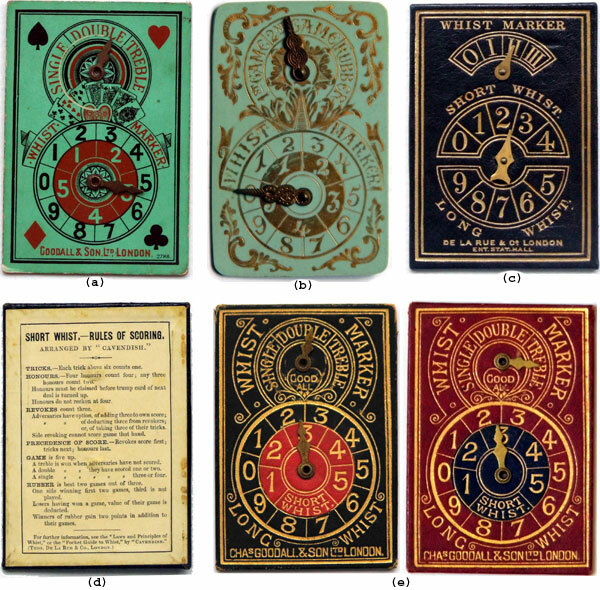 In the late 1800s, card makers Goodall & Son produced one of their first card markers using a now familiar design (a). As can be seen from the lower circle, this example can be used for Long or Short Whist. The upper circle took account of doubling the stakes during play. The back is plain. Other manufacturers used the same basic design, this one in an early form of plastic (b). From this time onwards, however, the competition between playing card and marker producers increased and the value of celebrity endorsement was in evidence for the first time. The name of the prominent whist guru “Cavendish” was used by De la Rue in promoting this revised version of the marker made from card and covered in “leatherette” (c). The rules on the reverse are “arranged by Cavendish” (d). Cavendish was the nom de plume used by Henry Jones (1831-1899), who wrote several books on whist in the second half of the 19th century and who became very prominent in the story of the evolution of whist as a “scientific” game. The notes on the card refer readers to two of Cavendish’s own books, published in 1900, which helps to date the marker fairly precisely. Above: various Whist markers manufactured by Chas Goodall & Son and De la Rue - see text left) for details. Images from the collection of Tony Hall. Competitors Chas Goodall & Sons were also in the market with a similar design, catering for both lengths of the game, but with rules “arranged by Capt. Crawley”. Chas Goodall & Sons (based in Camden Town) were at that time the largest producer of cards and card-playing materials in Britain and probably the world. Captain Crawley was another of the famous Whist players of his era and the author of several books on the subject. Such markers could be purchased in pairs (e), or as part of a boxed set, with cards and “mini-books” containing the basic rules and methods of play. As early as the 1860s, however, De la Rue tried a different approach and the link between the DLR company and Cavendish became even more established with the invention and promotion of the pressed-card slide marker, primarily directed at the dominant short whist market. As with earlier designs, each pair would have their own marker to be adjusted at the end of every hand. The slide markers at the top and right hand side are used to indicate points won; the sliders on the left, the number of games. Above: Whist markers manufactured by De la Rue & Co. and Chas Goodall & Son Ltd. De La Rue and “Cavendish” were jointly awarded the patent for the new design in 1868 (left). The Pall Mall in its most modest form (right). Above: Pall Mall Whist markers by Chas Goodall & Son. Each has the maker’s logo on either the front or the back, but not both. All were made in contrasting woods. Some were more elaborate than others but the basic design was the same. 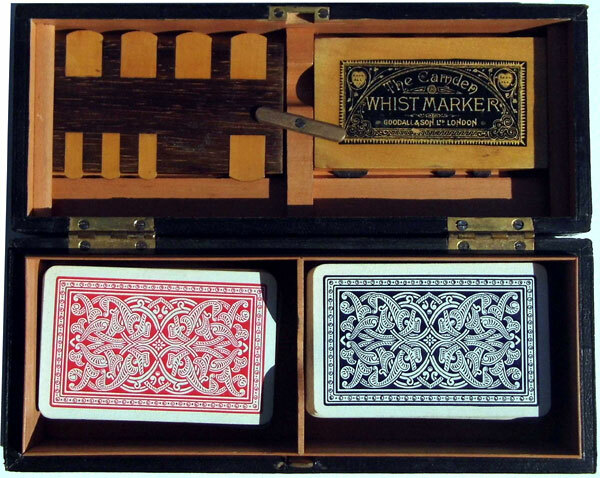 My personal favourites, initially, were the appropriately named “Camden” Whist Markers. This design and sheer tactile quality of this genuine antique was irresistible ... and I now have more than a few! Above: “Camden” Whist Markers. Some are marked “Entered at Stationers Hall” (i.e. patented) like the one on the left, while the earlier version (right) does not. On some, the tabs were made of plastic, bone or ivory. These standard size markers are 3.7 x 2 inches. Goodalls also produced a mini version (below). Above: Goodalls also produced a mini version. This pair is in a red leather case and appropriately designated “The Camden Tom Thumb” (2¼ x 1¼ inches). Some of the standard size versions were labelled with the name of the retailer, in this case “Pelham”, the Boots cash stationers. Interestingly with no reference to Goodall & son. Once this design was in the market place, there were many copiers in a wide range of different and more exotic materials to cater for the more wealthy players. I regret that I do not own any of the immaculately worked examples in gold and/or silver to illustrate, but I do have a pair of exquisite Japanese “Shibayama” markers. These are lacquered, painted and inlaid with mother of pearl, coral and a variety of stones. Above: pair of Japanese “Shibayama” Whist markers.